What do you understand when I say the word ‘SOPHISTICATED‘? For some, it’s a form of civilised behaviour while for some it’s just a euphemism for a snob. For me, it’s a part of the vocabulary. Just by replacing few words here and there, you can too become sophisticated, at least your communication skills will. Today we’ll start off with some easy words that you can use in everyday communications. • I’ll need some time to ponder on this deal’s profits. • That glib lawyer was talking a lot. • The alliance of two parties played a pivotal role to form the government. • Road accidents are the inevitable consequences of careless driving. • I won’t surrender so easily. • I believe his music is top-notch. • Sam persuaded his father to buy a new bike for him. Well, we are off to a good start. 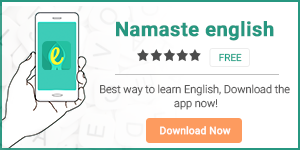 To learn more, download our English apps HinKhoj and Namaste English.